Afghan elders and clerics were trying to negotiate with militants holding 23 South Korean hostages in central Afghanistan a day after a purported Taliban spokesman said the hard-line militia had extended its deadline for their lives until Tuesday evening. The South Korean Defense Ministry, meanwhile, said it asked the Afghan military to refrain from conducting operations near the location where the hostages were believed to be held out of concern the kidnappers could be provoked. Villagers in Ghazni Province held a rally demanding that the hostages be released, said Mohammad Zaman, the deputy provincial police chief. Some carried banners and shouted slogans calling for the Koreans to be freed, he said. An AP Television News reporter saw 100 to 150 villagers demonstrating. 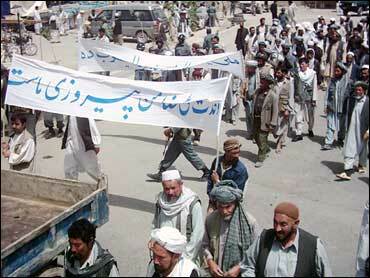 "We want the Taliban to release them, because they are guests," Zaman said. "They are in Afghanistan and we want them to be safe." A five-member delegation from Ghazni province traveled to a remote area of Qarabagh district Tuesday to try to secure the Koreans' freedom, said Khwaja Mohammad Sidiqi, the local police chief. "Our negotiations are continuing," said Khial Mohammad Husseini, a lawmaker representing Ghazni province in Afghanistan's parliament. "I hope that today we will get a good result." On Monday, Qari Yousef Ahmadi, who claims to speak for the Taliban, said the militants extended the deadline another day after the Afghan government refused to release any of the 23 Taliban prisoners the insurgents want freed. Though some of Ahmadi's statements turn out to be true, he has also made repeated false claims, calling into question the reliability of his information. The militants have pushed back their ultimatum on the Koreans' fate at least three times. Afghan officials in Ghazni province have met the militants in person and are also negotiating over the phone, but little progress appears to have been made so far. The deputy interior minister, Abdul Khaliq, meanwhile, said Monday Afghanistan was not prepared to make a deal "against our national interest and our constitution," though he did not explicitly rule out freeing any prisoners. The South Korean hostages, including 18 women, were kidnapped on Thursday while riding on a bus through Ghazni province on the Kabul-Kandahar highway, Afghanistan's main thoroughfare. The South Korean church the abductees attend has said it will suspend some of its volunteer work in Afghanistan and stressed its members were involved in medical and volunteer aid — not Christian missionary work. South Korea has about 200 troops serving with the 8,000-strong U.S.-led coalition in Afghanistan, largely working on humanitarian projects. They are scheduled to leave Afghanistan at the end of 2007. Ahmadi also said the militants are still holding one German and four Afghan hostages, despite Ahmadi's claims Saturday that those hostages had been shot and killed. He said the hardline militia were demanding the release of 10 Taliban prisoners in exchange for the German and Afghans. Originally, five Afghans were being held hostage, but one of them, the brother of Afghanistan's Parliament speaker Arif Noorzai, "escaped" from Taliban custody, Ahmadi said. Francesc Vendrell, the EU representative for Afghanistan, said officials are not convinced the Taliban is actually holding the German and the Afghans. Police have suggested a separate criminal group may be holding the five. Meanwhile, a Taliban veteran of Guantanamo Bay who became one of Pakistan's most-wanted rebel leaders killed himself with a hand grenade Tuesday after he was cornered by security forces, officials said. The death of Abdullah Mehsud was a boost for Pakistani authorities under pressure from the United States to crack down on Taliban and al Qaeda militants fighting on both sides of the Afghan border.